The timber of Southern Yellow Pine varies from a creamy-white colour to a light straw, or light reddish-brown. Our cut to size Southern Yellow Pine timber products (also called sawn to size) are literally sawn down to your chosen measurements and come straight off the saw with no machining performed to the edges, unlike our planed products. Sawn to Size Southern Yellow Pine is ideal if you don’t have the facility to cut timber down in-house. Southern Yellow Pine is commonly used for joinery, light construction, boxes and crates. 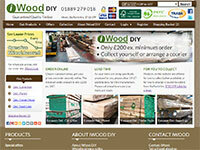 iWood is quickly becoming the UK’s number one timber merchants. Our website is designed to give you prices faster than anyone else at prices you’ll love. Don’t forget, you’ll instantly receive even better prices by signing up for one of our easy free website accounts.